Feb. 3 - 6 p.m. at ARIA: Traditional lion dance that will start at the main porte cochère and head through the casino. 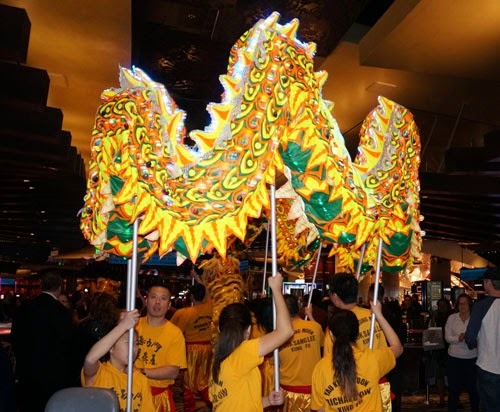 Feb. 5 - 7:30 p.m. and 10 p.m. at Gold Coast: Traditional dragon dance through the casino floor. Guests will also enjoy trees filled with candy and tangerines. Feb. 8 - 12 p.m. at Planet Hollywood Resort & Casino: Traditional lion dance through the casino floor. Feb. 8 - 1 p.m. at Paris Las Vegas: Traditional lion dance through the casino floor. Feb. 8 - 2 p.m. at Bally's Las Vegas: Traditional lion dance through the casino floor. Feb. 8 - 5 p.m. at Caesars Palace: Traditional lion dance through the casino floor. Feb. 12 - 7 p.m. at Rio All-Suite Hotel & Casino: Traditional lion dance through the casino floor. Feb. 14 - 6:00 and 9:00 p.m. at the Palms: A traditional lion dance is scheduled at the Palms main entrance to celebrate Chinese New Year. Feb 7 - 9 p.m. Fremont Street Experience will host "Chinese New Year In the Desert" Feb. 7-9. Kicking off the weekend of celebration.